Dubai, UAE, August 16, 2018: The SS2018 men’s watch collection celebrates Tommy Hilfiger’s love of motor sports, where speed and immediacy fuse with a touch of vintage nostalgia. This season the collection offers modern classics, sharp minimalistic silhouettes accented with sport details, along with race track-inspired power pieces, all featuring the iconic Tommy Hilfiger flag logo. 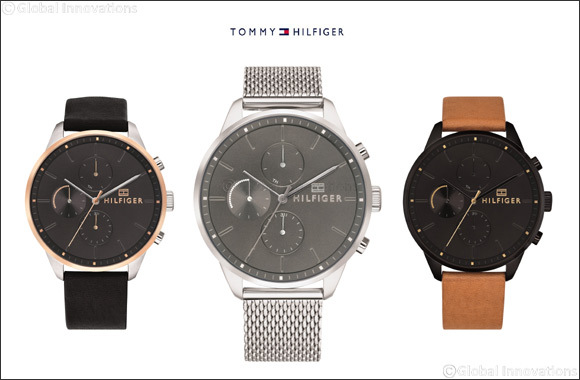 Casual inspiration is portrayed with a modern minimalistic Tommy touch in these round-theclock-ready men’s watches crafted in solid, two-toned/ grey / black ion-plated stainless steel 44mm cases.The smooth designs with multi-eye dials are refined by elegantly proportioned indexes and iconic Tommy Hilfiger logo. Available on link or mesh bracelets and smooth leather straps detailed with iconic red/white/blue accent. Water resistant to 5 ATM / 50 meters. The Tommy Hilfiger Dressed Up collections ranges from AED 700 - AED 1,000 and is available across Hour stores in UAE.